Following its cliff-hangar five-day flight from Nagoya, Japan to Kalaeloa Airport, Hawaii, Solar Impulse is undergoing an extended period of tender loving care, dedicated rebuilding of its battery packs and insightful reflection on how to avoid future issues. Landing July 3, 2015, Pilot André Borschberg broke the world records for distance along a course (6,825.4 kilometers – 4,231.5 miles), Straight distance, and Duration for solar aviation, as well as the world record for the longest solo flight ever (80 hours and 5,663 km. – 3,511 miles), according to the Solar Impulse web site. 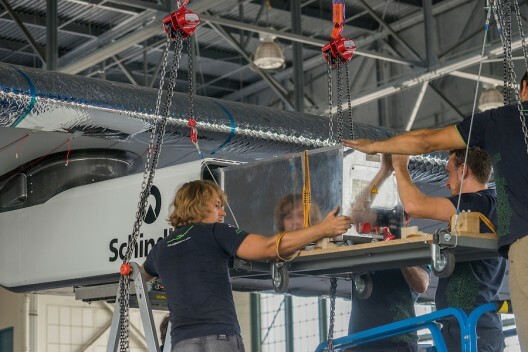 If all had gone according to plan, Bertrand Piccard would have hopped on board a few days later and headed for the United States on the second leg of the trans-pacific part of the the team’s around-the-world voyage. Unfortunately, the rigors of a test flight over Nagoya, followed by a climb to 28,000 feet too soon after that test flight, seems to have doomed at least some of the batteries. Andre’ noted the rising temperatures in the battery packs on the first day’s climb, and doubtless had to treat the throttles on the big bird in a gingerly fashion every one of the four days following. Even will all systems “go,” the airplane would greet the dawn with a minimal charge. Andre’ had to monitor all systems with extreme care through the Nagoya to Hawaii leg. Container boxes are being shock tested in Dubendorf, Germany and should be ready for the Kokam cells to be “boxed” by the end of this month, with final assembly and testing taking place in December. After all has been assembled and tested, the battery boxes will be installed in the motor housing (or gondola), and finally hung on Solar Impulses’ wings. 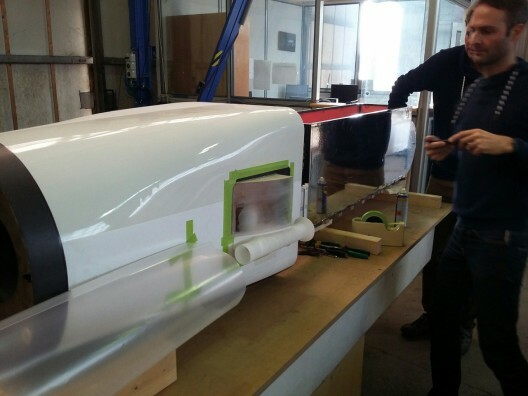 We will all be awaiting the spring and the final legs of Solar Impulse’s epic journey. In the meantime, Borschberg and Piccard will appear at the upcoming COP21 (Congress of Parties 21) a major event in trying to build global consensus on what to do about global warming. In their typical fashion, they show positive alternatives to more onerous restrictions. Dr. Piccard suggests seven ways to solve the problem, all with positive economic, social and environmental benefits for all. How can we motivate people against climate change if we continue to focus on the amplitude of the problem? The current discourse is depressing and makes the situation seem insurmountable. Mobilization will only become possible if we emphasize the tangible benefits of existing clean solutions: we can already cut CO2 emissions by half, when replacing old polluting devices in the field of industry, construction, heating, cooling, lighting and mobility with today’s energy-efficient technologies. Asking people to make sacrifices for no immediate return only creates resistance. Who would renounce driving their car because of sea levels rising in 30 years? On the contrary, let’s demonstrate that everyone can maintain and even improve their standard of living thanks to affordable and accessible clean technology solutions, while at the same time reducing the impact of their lifestyle on the environment. When we hear politicians wanting to reduce CO2 emissions by X% or limit temperature increases to 2°C, it comes across as wishful thinking. Nothing will ever happen if they don’t also set out very clear legal framework, procedures and concrete technological solutions to realize these goals. Very few people will change their current behavior in favor of those living in the future. Let’s demonstrate that the changes we need can already deliver a favorable result on today’s economic, industrial and political development. As much for the success of their flight as for their influence on world leaders, we wish Andre’ Borschberg and Bertrand Piccard the best of luck.